Don’t miss the Sunday edition of The State newspaper this weekend. Saluda River Club’s newest advertisement is featured in the paper with a big announcement of a special new promotion: Buy a home in Saluda River Club and the golf cart’s on us! Pick up the Sunday paper or visit The State’s website at TheState.com. 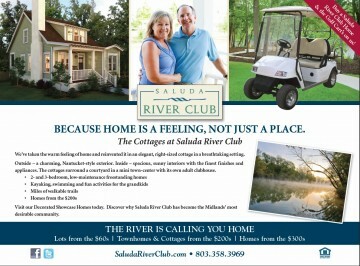 Saluda River Club offers lots from the $60s, townhomes and cottages from the $200s and homes from the $300s. Find your dream home at Saluda River Club in the Village District, a new urban “town center” of townhomes and cottages, or the River District, executive estates situated along the banks of the Saluda River. Whatever it is that you are looking for, Saluda River Club has you covered. Come home to Saluda River Club today and live life in all its dimensions. Visit SaludaRiverClub.com for more information or call 803-358-3969 to schedule your private tour.